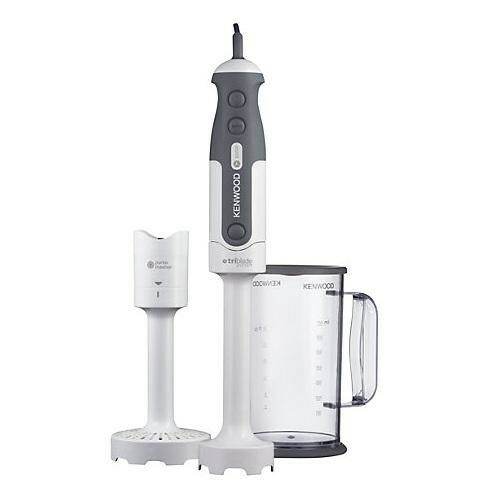 The Kenwood HDP300WH Triblade Hand Blender 800W in white is the ideal kitchen appliance that will help you in the kitchen when creating delicious food. The triblade system uses 3 angled stainless steel blades that rotate on 3 different paths to ensure the ingredients get blended with ease and efficiently and the sure grip handle is ergonomically designed to ensure complete comfort while blending. The 800W motor will help the blender to power through the ingredients and is very simple to use with 1 speed and a turbo setting for the stubborn ingredients.